There is a thread on my favorite Chicago food chat about cooking from your CSA box, but everyone there is in (pretty much) the same climate zone as I am, making the ingredients somewhat similar. I'm curious what you-all in your different zones are getting in your boxes, or at your farmers' markets, or from your own gardens. Here (photo below) is my first week' haul. As my daughter said, "It's greeeeen." My usual strategy is too cook whatever is most perishable first, then whatever is taking up the most space in my refrigerator. So, the giant bag of spinach turned into three servings of spinach with garlic and crispy sopressata-- an adaptation of the kale with crispy salami in Issue 105. My CSA person got sick and had to temporarily abandon the garden, but is trying to get back on track slowly. This time of year we have a lot of vegetables stands/local farmers and the produce etc is just fantastic. What I really enjoy is the corn, several varieties and they stagger the plantings so we have lots of corn for a longer period of time. This area is famous for Bogue Sound melons and we love the melons grown around here. Ha, now I am just envious of the great produce you are getting! I got kale, beets, and broccoli this week, plus 4 turnips the size of marbles. ICD, have you been doing much Cook the Issue? Liamsaunt seems to be doing most of the cooking right now. I've been slacking too-- I'm hoping the next issue will come out soon and rescue me from my doldrums. What is "your CSA box." Harebrained lagomorph, prestidigitations exist for pre-adolescents. It was delicious-- I picked up some takeout lamb vindaloo for an accompaniment and this went perfectly. That's my cheapskate takeout strategy-- get an order of whatever is hardest to make, then fill in with side dishes and rice at home. My husband ate three servings, but the kid wouldn't touch it. I thought it was better than what we usually get in the restaurants-- the fresh spinach was a gorgeous green color too. Anyone else cooking from the CSA/farmers market? Also, I got radishes-- has anyone tried Molly Stevens' Butter-braised radishes? I have arugula too-- that will be for a salad to accompany the grilled MEAT that daddy and daughter requested for father's day. At the farmers market the local strawberries are out and I am starting to see some spinach and lettuce. Nothing too exciting yet so I am still going to my usual vendor at the market but not everything is local. I love local strawberries-- we have been getting reports that this is not a good year for strawbs, with the cold and wet weather. Have you made anything strawberry yet? Like the cover recipe strawberry shortcake? I made that with non-local berries and it was great-- local berries would be amazing. Not yet but I was considering making strawberry or raspberry jam or like last year making strawberry ice cream which was oh so good! I don't have an icream maker so I had to put the bowl in the freezer and whip it every 20min or so! it was crazy but well worth the effort. Well my poor CSA has had a disastrous season so far, so I am finding things at local vegetables stands grown by our local farmers, but I have planted tomatoes and peppers, lots of peppers and the tomatoes are starting to come in on a regular basis and there should be plenty for the grands to pick throughout there July visit. My herbs are doing fantastic planted along a pathway and in pots this year. Thank God for well water, we haven't had a lot of rain, I hear that some of the farmers might lose second corn etc. crops if we don't get some pretty steady rain. ICD, that is too bad about your CSA, but your containers look beautiful! I got turnips this week, anyone have suggestions??? Hey ICD and all, (sorry about the email notifications-- how many are you getting now?). Which was really good, although I do feel like bacon kind of counteracts all the goodness of the spinach. Nevertheless, it was really tasty. 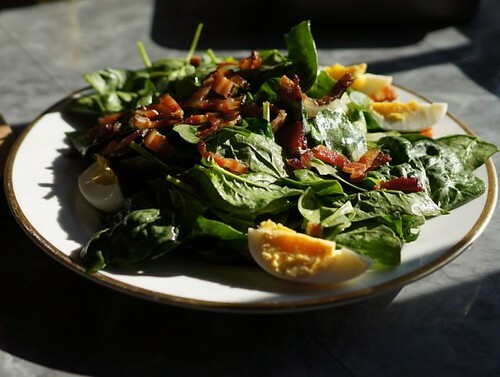 What is it about spinach that compells us to cover it with cream, or bacon (or both)? And, even though it is a year later, I'm still looking for turnip suggestions! Anyone else cooking with the first veg of the season? To have tomatoes this early on would be a dream!!! for us it is really end of August early September when they start to come out. They look beautiful. I have a cherry tomato plant in a pot (courtesy of my friend). We'll see how it does. I'm not the best at keeping container plants watered. This was great because I had a lot of eggplant and tomatoes in my csa box this week. I skipped the olives, feta, and mint, to just let the veggie flavor shine. It was delicious-- I love a good gratin, especially with cheesy breadcrumbs. And I know it was good because my husband liked it-- and he is averse to most tomato combinations, having been over-tomatoed in his youth. I bet he would have really loved it with the olives-- maybe next time! It wasn't as juicy as expected-- I think I should have used regular rather than convection. We cooked the eggplants for the dip on the grill over the weekend, but I haven't had time for the dip-- plus I am out of white beans, so I stuck the cooked eggplant flesh in the freezer-- I think (hope!) that this will work okay for a dip, but it would probably be bad for other eggplant preps. Anyone else have eggplant/tomato thoughts? This is timely, I have two eggplants I need to use from last week's CSA pickup since I get another box tomorrow. That gratin looks good. Another recipe I really like is Marcella Hazan's eggplant patties/fritters. Have you tried that one? And earlier today I was looking at a Mario Batali recipe for eggplant "meatballs." Hope you guys have been well. I haven't checked in here in forever. I've been doing a lot of traveling this summer--which has meant that other people have been benefiting from my CSA share! Hey, good to "see" you, I hope you've been enjoying your travels! Do let me know if you get any eggplant inspiration-- somehow I manage to get through the zucchini, but always have a hard time with eggplant. Okay I tried the smoky eggplant and white bean dip-- it was very tasty, with a great creamy texture, but very mild. It was really good with a few splashed of hot sauce to liven things up! And plenty of it this year and I have used fresh tomatoes a good part of the time. Took a huge bowl to a party last week and you know what it is great on pasta. Peel 2 medium eggplants, cut them into1- inch dice, sprinkle these with salt and let them stand for an hour. Dice 4 stalks of celery very small, parboil for 2 minutes, drain, and measure out 1 cup of the celery. Slice 3 medium onions thinly. Rinse and dry the diced eggplant and saute it in 1 cup of hot olive oil about 10 minutes, until it is lightly browned; remove the eggplant with a slotted spoon and reserve it. Add another 1/2 cup of olive oil to the pan, heat it, and sauté the sliced onions in it until they are soft but not browned. Then add the cup of parboiled celery and 3/4 cup of tomato puree, and simmer the mixture for 15 minutes, stirring often. Now add: 2 tablespoons of salted Italian capers, rinsed and drained; a dozen Italian oil cured olives, pitted and finely chopped; and 1 tablespoon of pine nuts. Heat 1/4 cup of red-wine vinegar, dissolve it in 2 tablespoons sugar and 1/2 teaspoon of salt, add the sauteed eggplant, and simmer it, covered over low heat and stirring often, for 10 minutes, until it is thick and condensed: have a little extra tomato sauce handy to add in case it should get too dry. Caponata should dark and pungently sweet and sour. Serve it chilled, as an hors-d'oeuvre, with crusty Italian bread. I sauté the celery with the onions some times and add in fresh small tomatoes. Taste to see if you need more sugar or vinegar.